Here’s something that I as a white person can never really know — what’s it like for non-white children when they have to sit through an education system that still normalizes and glorifies white people and white ways, more or less all of the time? A system that also still denigrates the contributions and lived experiences of people of color, more or less all of the time? STOP TAKING THIS LIST AND POSTING IT ON WIKIPEDIA. DO YOUR OWN DAMN RESEARCH! Eugenia “Skeeter” Phelan – Recent graduate of Ole Miss, has returned to her hometown of Jackson, Mississippi to find a job and find herself. This leaves her open to seeing her hometown’s inequitable treatment of the black domestics, primarily the female maids in the employ of her friends. Skeeter both admires and fears disappointing her mother and her friend Hilly, yet she pursues completing a manuscript called Help with primary assistance from her good friend’s maid named Aibileen. She also seeks the reason her beloved maid Constantine abruptly left her family’s employ. Aibileen is a nurturing character, and her tender affection for Mrs. Leefolt’s two year old daughter Mae Mobley is a strong beginning. Aibileen is wary of involving herself in a book on domestics in Jackson, Mississippi. However, because she serves as the “bridge”character, or the mediator between Skeeter and the other black maids needed for the project, she soon warms up to Skeeter. Aibileen’s adult son Treelore has been dead a couple of years when the book begins, and her husband left her for another woman when Treelore was just a boy. So the manuscript gives Aibileen something to do besides running the Leefolt household. Because her character is the affable guide, her participation in Skeeter’s book leaves her at the mercy of Hilly. At the end of the novel, though she’s saddened to be dismissed from the Leefolt household (due to Hilly’s insistence), her spirit is not broken. Minny Jackson – The “sassy” maid, Minny’s mouth has gotten her into trouble one too many times. Aibileen’s friend, and a character who’s unable to keep employment because of her bossy demeanor and sharp tongue. After she loses her job with Miss Walters (Hilly’s mother), Aibileen helps her land another one with Celia Foote, who’s considered white trash and is shunned by sorority sisters and socialites like Hilly and Elizabeth. Minny is married with five children and a sixth on the way. Hilly Holbrook – Childhood friend of Skeeter and Elizabeth, the president of the Junior League in Jackson, Mississppi. Roomed with Skeeter at Ole Miss for two years, dropped out to get married. Her husband is running for the senate, and Hilly tries to push through a sanitation initiative so that all the white homeowners have a separate bathroom (outside, like an outhouse) for their black domestics. Hilly is a woman who enjoys controlling others and striking fear into those who dare oppose her. When Skeeter begins working with the maids and subsequently has “Help” published, she runs afoul of big bad Hilly. Celia Foote – Newest resident of Jackson, Mississippi, winds up hiring Minny because she cannot cook and initially tries to hide Minny’s involvement with the house cleaning and cooking from her husband, Johnny Foote. Celia has also been unsucessful at carrying a fetus to term. She forms an unlikely bond with the sharp tongued Minny. Celia dresses provocatively, but is really a sweet person. She’s also unaware of the history between her husband and Hilly (they were together prior to Johnny meeting Celia). Elizabeth Leefolt – employer of Aibileen, best friends with Hilly and Skeeter. Elizabeth is easily lead by Hilly. She’s also unable to be an affectionate mother to her daughter Mae Mobley, and so Aibileen becomes the child’s primary caretaker, teacher and surrogate mother. Has a son named Ross later in the novel. Aibileen calls him Li’l Man. Charlotte Phelan – Skeeter’s demanding , overbearing mother. She’s also stricken with cancer, but tells Skeeter she has “refused to die.” Skeeter has never been able to live up to her mother’s ideal of how she should look and behave. Their relationship is a tenuous one. Charlotte is concerned with Skeeter being the proper lady, while Skeeter longs to be anything but. Stuart Whitworth – Hilly sets Skeeter up on a blind date with Stuart, a senator’s son. While Stuart is handsome, charming, and appears to be smitten with Skeeter (after a disasterous blind date), when he learns of her involvement with the maid’s stories, he immediately takes back his engagement ring. Mae Mobley Leefolt – Toddler watched daily by Aibileen and one of Elizabeth Leefolt’s two children. Because Mae’s mother is unable and unwilling to devote time and attention to her, the child turns to Aibileen, who treats her with tenderness and love. When the novel begins Mae is two years old. By the time the novel ends, Mae is five and in school, old enough at the novel’s end to beg Aibileen to stay, after Elizabeth Leefolt fires the maid at Hilly’s insistence. Leroy Jackson – Minny’s husband. He’s abusive towards her and frequently drunk. He’s fired from his job when Minny’s involvement in the book is suspected. Constantine Bates- Skeeter’s beloved childhood maid. The mystery behind Constantine’s rather abrupt departure from the Phelan household (while Skeeter was away at college) fuels Skeeter’ s desire to solve the mystery of why she left, and how Aibileen and the other domestics feel about being employed by the residents of Jackson, Mississippi. Elaine Stein – Harper & Row Publishing house editor.“Missus Stein” as she’s referred to by Skeeter in the book, takes an interest in Skeeter because she found it “admirable that that a young lady with absolutely no work experience would apply for an editing job at a publisher as prestigious as ours.” That excerpt is part of the letter Missus Stein sends in response to Skeeter’s resume. Elaine Stein corresponds with Skeeter over the length of the novel, advising her to write about what disturbs you, particularly if it bothers no one else. After hearing Aibileen speak of her deceased son Treelore’s idea to write about his experience working for a white employer, Skeeter decides to tweak and expand this idea under the guidance of Missus Stein. Elaine Stein is also Jewish, and Skeeter realizes I have never met a Jewish person. Yule May Crookle – Hilly’s maid, and also the only black maid without a pronounced southern accent (Lulabelle and Gretchen don’t have “southern” sounding dialect or accent either). This is probably attributed to her years of college, though the book states she never graduated. Yule May is described as tall, with a better figure than Hilly. She also steals a ring from Hilly in a mis-guided attempt to send one of her college aged twin sons to a private college (one twin’s tuition is already paid, but Yule May and her husband were short seventy-five dollars for the other twin’s tuition) This results in a supposedly smart woman stealing from Hilly of all people, a woman who’d previously turned down Yule May’s request for a loan and believes every white home in Jackson, Mississippi should have separate outhouses for their black domestics. And yes, Yule May’s last name is Crookle as in she’s in jail because she is a”crook” which is part of her last name. Another poster pointed this out on the Amazon.com site. I believe this is the author’s mis-placed attempt yet again at being funny. Lulabelle Bates – Near white looking daughter of Constantine. Is sent away to a Chicago orphanage at the age of four, runs afoul of Charlotte Phelan when she returns to Jackson to see her mother and mingles with members of DAR (Daughters of the American Revolution) during a meeting being held in the Phelan house. Carlton Phelan – Skeeter’s father, owns a cotton farm though it’s also referred to as a plantation. Is quite liberal in his views on race. Carlton Phelan (Jr?) – Skeeter’s older brother. Attends LSU for law, is described as tall and handsome with blonde wavy hair. Johnny Foote – Celia’s loyal husband. He owns a real estate office in Jackson, Mississippi. He’s also Minny’s employer. Raleigh Leefolt – Elizabeth Leefolt’s husband and Aibileen’s employer. William Holbrook – Hilly’s husband. Has political aspirations of winning Stoolie Whitworth’s state senate position. Senator “Stoolie” Whitworth – Stuart Whitworth’s father. Kindra Jackson– Minny’s youngest child, is five years old when the novel begins. Equipped with a smart mouth just like her mother, Minny laments that her bossy daughter is just like her. Pascagoula – The maid who replaces Constantine in the Phelan household. She’s Yule May’s cousin. Gretchen – Younger maid who tells off Skeeter and Aibileen, telling Skeeter that the maids really hate her, and then she calls Aibileen stupid. In defense of Skeeter, Aibileen demands Gretchen leave her house. Gretchen’s also Yule May’s cousin. Sugar Jackson – Minny’s daughter and sometime domestic for Celia Foote. Minny smacks Sugar when she overhears the girl laughing and gossiping about a drunk Celia’s appearance at The Benefit, also called the Jackson Junior League Annual Ball in the novel. Reverend Johnson – The pastor of the church Aibileen, Minny and most of the maids in The Help attend. Treelore Clark- Aibileen’s son. Only lived to be twenty-four. Died in an accident on the job. It’s his idea to write about working for a white employer. After Aibileen reveals this, Skeeter asks to use his premise for the maid’s book. Clyde Clark – Aibileen Clark’s estranged husband. Aibileen states that he ran off with another woman when Treelore was a youngster. Ross Leefolt – Elizabeth Leefolt’s second child. Also called “Li’l Man” by Aibileen. Mister Golden – works for the Jackson Journal, hires Skeeter to take over the Miss Myrna column (the Miss Myrna column provides housekeeping tips). Mister Golden allows Aibileen to take over the column after Skeeter leaves town. Naked, unknown pervert – Comes out of the woods and jacks off, then throws an object through one of Celia’s windows. When Minny goes outside to confront him, he gains the upper hand and punches her in the head. Celia saves her by beating the man unconscious with a fireplace poker. When he regains consciousness, he departs into the woods surrounding Celia house. No real purpose for his intrusion, other than it enables Minny and Celia to further bond from such a weird, traumatic experience. So where the kids in Mae Mobley’s school still separated? For the fictional book, no. The movie probably does the same thing. Remember Mr. Leefolt caught Mae playing Woolworth’s (Pg 431) and almost playing back of the bus, so he asked her who taught her that. She lied and said it was Miss Taylor, her teacher. But in real life Jackson, Mississippi resisted integration even though the Supreme Court ruled in 1954 that segregated schools were illegal. After the Civil Rights Act in 1964, many whites in the south pulled their kids out of public schools and established private ones. I should have a post up about that soon. In my opinion Aibileen is not the main character. That honor goes to Skeeter. 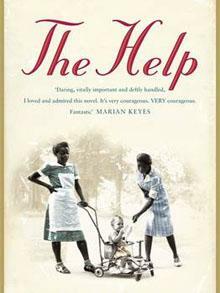 Though Aibileen starts the novel off, and the book is called The Help, the reader soon learns more about Skeeter than any other character. Aibileen has no balanced life, no romantic interest, no real dreams, as it stands both she and Minny are simply in the novel to advance Skeeter’s plot, which is finding out why Constantine left and helping Skeeter connect with enough other maids to get the novel Help completed, so Skeeter can then land the job of her dreams in publishing. Which does happen, enabling her to leave Jackson. That is one of the major issues of the novel, especially from the perspective of a reader picking up the book and thinking the primary maids stories will be the main story, when its actually Skeeter. There are some who’ll argue that the characters share the pages equally, but neither Minny nor Aibileen have a backstory, and the reader is not privy to their real feelings. It’s all in the context of following Skeeter. And that’s why imo the movie lists Emma Stone as the lead character, not Viola Davis. I honestly disagree. I’ve only seen the movie, and yes, I think there’s too much focus on Skeeter, but you have to remember that white people were a huge part of this time period as well. In the movie, Skeeter is portrayed as a freak, ugly, an outcast, a hippie, her mother even asks if she’s a lesbian because she wants a job more than a husband. In reality, people who were for civil rights were seen similarly. While there’s more backstory on Skeeter, it’s important because we learn how she’s not prejudice due to being raised by her maid Constantine, and how her boyfriend left her since he thought she was selfish and stirring up trouble. The movie also, to me, puts good emphasis on Minny and Aibileen. I was so happy to see Minny be treated fairly when she worked for Celia. And hearing Aibileen’s stories, seeing her have to deal with the KKK, the fear of being seen with Skeeter and the consequences that might follow, etc. was also harsh. The movie being narrated by Aibileen also put more emphasis on Minny and Aibileen. It was scary watching Minny suffer domestic abuse and Aibileen not being able to help her best friend. Skeeter, Aibileen and Minny are the three protagonists that stay protagonists throughout the entire story. I’m sorry, but I’m not sure what you disagree with. No one stated that Skeeter, Minny or Aibileen weren’t protagonists. However, the book makes it clear that Skeeter is the lead, and I’ve listed the chapters that confirm this. While the film starts with Aibileen’s narration, please also note that Emma Stone was touted as the lead character during the early stages of the movie, until reviewers took note of Viola Davis and Octavia Spencer’s performances. After that, the focus was less on Emma Stone’s character (and to be fair, many reviewers highlighted Davis and Spencer far more than Stone. Even Disney’s blurb on the movie talks primarily about Skeeter’s journey, as the maids are simply there because this is her coming of age story. Skeeter is gifted with a love interest and her family life is dwelled upon. Not so for either Minny or Aibileen, as the filmgoer doesn’t get info on who fathered Aibileen’s deceased son, or who her spouse was and why he was no longer by her side (Aibileen was married in the novel. The movie skips over this because the book painted her husband as yet another stereotypical black male). As far as what I have to remember, I think I need to state that I grew up during this time period. It’s the author who was born in 1969. Not me. And while Skeeter, in the novel is written as ugly and also an outcast, you’d be hard pressed to call Emma Stone ugly, even with huge glasses and crimped hair. No, people who were for civil rights were not seen similarly, especially those who were black. The fictional Skeeter was able to straighten her hair and move quite nicely within her white world. So its no stretch to say that with Skeeter leaving Jackson, she still made out better than the maids, because being white during this time period was still an advantage, no matter if one were ugly or beautiful, or if they wore their liberalism on their sleeve. Blacks fighting for civil rights were arrested, assaulted or killed at a much higher ratio than whites who joined in with the freedom movement. We were considered inferior, no matter our education level or economic status. Remnants of that mindset still exist today in America. As far as Skeeter not being prejudiced, that’s another wish fulfilling movie trope. Skeeter graduated from Ole Miss, and during that period, Ole Miss wasn’t graduating liberals. You might do well to Google just how set the school was on maintaining racial segregation. There was even a riot where a French reporter died. The riot was by whites and white students, not blacks. Aibileen and the KKK appears added for the movie, after Tate Taylor got wind of criticism. I’ve read the book and I have a copy of the initial screenplay and the final screenplay, and have published interview quotes on this site by the principals. I’m sorry to be the one to tell you this, but The Help is filtered through the eyes of a group of southern friends who had no clue regarding what African Americans went through, but wanted to get a foothold into Hollywood. And they succeeded by filling the screen with caricatures of black women in order to pull the heartstrings of those, like yourself. What kind of asinine advice/movie dialogue is that? Minny is a MAMMY. Thus, you would love her, because she represents an accepted, stock image of black womanhood, those who need to be led by a white character (Skeeter) and who live to give support, humor and love without anything in return, simply because the writer deems it so. This type of character for people of color has been used time and time again in older films, early television shows (Beulah for example) and books. Sorry, but while you went in simply to enjoy a movie, I saw a resurrection of the very stereotypes African Americans have fought for years to distance themselves from. 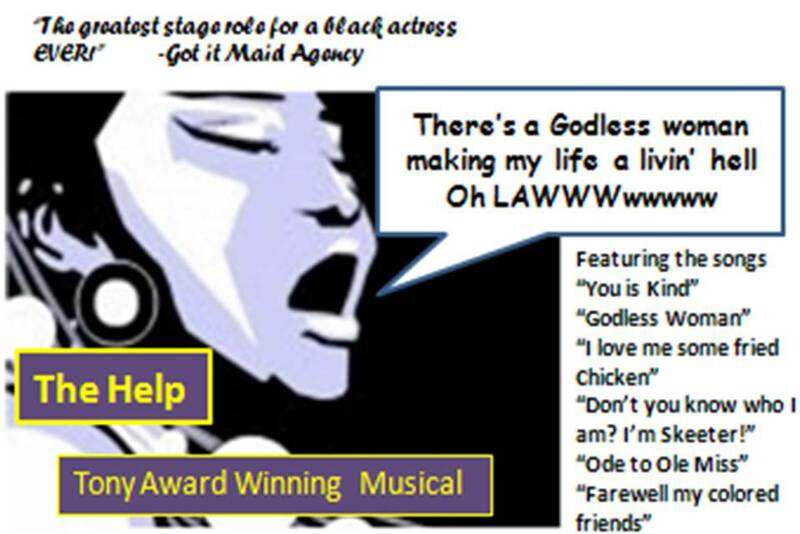 As I’ve stated previously, Aibileen is the loyal, suffering in silence Mammy maid, a part Louise Beavers perfected in the 1933 movie “Imitation of Life”. Minny was simply an updated Mammy from Gone with the Wind for a new generation. See the answer to your question below your second request. Thanks for posting! Aibileen was the main character, she was the first who agreed to tell the story (of which the book is titled). Imagine what courage it took and what she risked. Skeeter was great! Her honesty in dealing with people on a basic, equal level was admirable, but I don’t view her as the main character. Skeeter is indeed the main character, as the reader learns more about her than any other character. We learn about her father, mother, even her brother who’s a very minor character. Skeeter is also the only character who goes on a journey, not just realizing she’s outgrown her friends, but physically leaving Jackson as the maids make it possible for her to attain her dream in publishing. And there’s nothing “honest” about basically using a minority group, as this character observes them by stating they’re “so black I couldn’t tell them apart” or “black as asphalt” or “black as night” and not once admitting whether she believes African Americans and whites are equal or segregation is wrong. You won’t find any such soul searching or revelation in the novel. The closest is the ambigious “Wasn’t that the point of the book? For women to realize, We are just two people. Not that much separates us. Not nearly as much as I’d thought. Yet even though Minny and Aibileen implore Skeeter to go to NYC, does Skeeter impart any real affection back to them? IMO No. Even after she’s set to leave Jackson, MS. it’s the maid who reaches out to hug her, and to admire her hair and gifts Skeeter with their book signed by church members, yet all Skeeter can say is “Thank you” and tells Aibileen she’s earned the job of Miss Myrna, which is a no brainer since Aibileen was doing the job anyway. Yet Skeeter doesn’t gift her with the typewriter or any further assistance, because as history shows, Jackson was still segregated after the Civil Rights Act was passed in 1964. It took a number of years for the city and the state of Mississippi to realize things had changed and blacks were no longer merely their “Servants” and second class citizens. Because Skeeter never really has to “face” anything. It’s merely implied. She’s a poor protagonist and a stand in for the author. Stockett swoops in several times to play omni-present narrator in order to rehibilitate the white male characters stating Stuart is an “good man” on their final meeting, and that her father is an “honest” man, yet she admits she’s never known his stance on integration or blacks even though he has a number of African American workers. That’s BS. Here’s a breakdown of the chapters and the characters. Also note that in many of the chapters with Aibileen and Minny, they’re talking about white characters (Aibileen about Miss Leefolt and Mae Mobley, and Hilly. Minny about Celia Foote and Johnny). Their homelives take a backseat once this occurs. Yet Skeeter finds and lands a fiance, her mother combats cancer, she creates a manuscript and breaks up with her suitor. Aibileen and Minny’s storylines don’t contain half as much. Aibileen’s storyline is centered around the Leefolts and Skeeter, and Minny’s is centered around Celia and to a lesser extent, Leroy. 25-The Benefit (no main character narrative presented, it may be in third person subjective but I have to check). If anyone has the proper term please leave the answer. Thank you for this detailed character listing and chapter breakdown. This will be useful for my project. The tense in The Benefit was third person omniscient, i believe, since the narrator seemed to hover over the scene, recounting the effects of the scene from multiple perspectives, yet not aligning itself with anyone (which was both a clever bit of narrative respite and jarring). Third person objective may also work since we don’t get much interiority from any single party. And while I am here, allow me to commend you on such a robust and active collection of materials. This blog is a useful resource for approaching the novel. Though I disagree with many of your claims (largely because I interpret the documents and the novel as a whole differently), this blog has been a wealth of information and I thank you. This whole “who is the main character” thing is interesting because ultimately, Stockett had some control of the situation. I’m writing a paper for school on Hilly-Minny-Celia, and I suppose I think it’s the more important assocation, which I guess is the difference between “important” and “main.” I can’t say I really found much depth in Skeeter. What does seem to be the juicier part of the whole story is class issue in Hilly-Minny-Celia. People can hop on and make all sorts of excuses as to why they think they aren’t racist, but when you start throwing money and class backgrounds in the conversation, everything changes. Heated debates became tinderboxes. I really wish there was more in the novel about Celia. Obviously, we are supposed to like her, but it’s strange, she’s acceptable now because her image is one of Marilyn Monroe. I wonder if we would feel the same if she was Joy Turner from the TV series My Name is Earl. Actors on the set noted Stockett’s mother looked and sounded as if she were a ringer for Celia. If I find the interview again I’ll post the link. I’d orignally guessed Celia was inspired by Stockett’ mom, who the author admits dressed in tight skirts and was liberal in her racial views. But I also think this hindered Stockett from fully exploring the character. Thus Celia is more of an infantile acting heroine in the book without much bite. I would have enjoyed a more honest give and take between Celia and Minny. And Celia didn’t read as white trash in the traditional sense to me. Not knowing how to cook very well, that I can believe. Lots of people can’t cook. But not knowing her way around a kitchen in the 1960s where all women, regardless of race were expected to be “barefoot and pregnant” or at the very least able to boil water was far fetched imo. But I agree that the side characters were stronger than Skeeter’s storyline. That may be partly why even Emma Stone couldn’t save the character, as the part hasn’t gained her any award nominations. Your character analysis of Skeeter is dead on. Great job! in the story one of aibleens friends’ son goes blind from being beaten by white police.. what is aibleen’s friend’s name? That scene was created for the film. The Reverend never gives a speech like that in the book. The ministers in the novel are Reverend Johnson and Deacon Thoroughgood, and neither has a major role (or stirring speech) in the novel. Can I use this in a project? You’d have to define “use.” Citing others work is the permissible standard, such as using quotation marks and listing where you got it, etc. When in doubt ask your instructor. If you wish to include a link to this page in your own work (which is a form of listing where you got it) that’s also routine in school projects. Again, you’d have to give me more information on what you plan on doing. who displayed great courage in the story? and I need details from the story, please? I’m sorry, but I don’t think I can help with that question. This isn’t a site that praises The Help, but looks at it critically. There are far more sites and reviews praising the book than those like mine, so while the standard answer would be Skeeter and the maids who offered to help her, real history shows that domestics were on the forefront of fighting for civil rights, unlike the story has it portrayed. In the next paragraph Aibileen crows about telling her “stories.” Unfortunately, Stockett’s main black characters show a loathing for their own community, their loved ones and in Aibileen’s case, her skin color in several instances in the book, contrary to what some readers, who know little about the African American mindset and culture during this timeperiod believe. I recall segregation, that’s why there’s no one in this novel I can truly state as “courageous.” While the novel mentions what repercussions the maids who help Skeeter might face, the author admitted in an interview with Katie Couric that she could never let any harm come to her characters. I think my issue, is when Stockett set the story in Jackson, MS, where African Americans gave their lives in an effort for equality, yet chose to portray Jackson as if it wasn’t that bad for the blacks living there. Jackson MS in the 1960s was an oppressive, violent place for those of color, especially those wanting equality. Even when children and teens marched, they were arrested. So no, I can’t honestly state instances of “courage” in this novel. You may want to type your question into a search engine, and you’ll possibly find your answer that way. I wish you the best with this. Would you say that the racial dynamics were portrayed as more harsh in the book than the movie? I’d say the racial dynamics were whitewashed in both the book and the movie, making it seem as though Jackson, MS wasn’t the hotbed of violence and racism it actually was, and that a 24 year old socialite named Hilly was the cause of all the racial problems because she lorded over her group of friends. so what characters reflect stockett’s values the most and why? You’ll have to read the book and make that call for yourself. This isn’t a site that praises the novel, and I seriously doubt that a fictional book can give a reader a clear idea of the “values” held by the author. I’ll give you some examples. The book never mentions whether Minny loves her kids. She says she’s proud of them, but she never mentions the word “love.” Also, the black characters are not described as attractive. Not one. The closest is Yule May, when her figure is mentioned by Skeeter in relationship to Hilly’s. But the author of the novel describes most of the darker hued maids as overweight, lacking command of the English language, and not that interested in the growing civil rights movement, when actual history shows that black domestics were vital and vocal to the cause, especially in Jackson Ms. Also, the author makes a grave error in putting dialogue into the black characters mouths that were the insulting jokes of bigoted whites at the time (I recall segregation and my family is from the south). When Aibileen makes the joke to one of her now grown kids that she used to watch, “Don’t drink coffee or you’ll turn colored” that’s an old insult bigots used, because ingesting anything dark was likened to tainting someone white (like rock and roll music that they used to call “jungle” music and said blacks were corrupting the morals of decent white kids with our kinds of dances and rhythms). But a word of caution. From my research (of public interviews by those involved with the novel’s creation) The Help appears to be a collaboration of sorts, with Stockett taking credit for writing the novel because she had the pedigree of her family name (Stockettt stables, etc.) Tate Taylor writing the screenplay and directing, because he was her good friend and they had a “deal” of some sort from very early on, as per Stockett’s reveal in several interviews. Octavia Spencer became their black friend validation card, because Stockett revealed in an audio interview in Dec of 2009 which is still up on Audible.com that Spencer would get the part of Minny, as that was part of the “agreement”. Stockett also championed Spencer’s participation in the audio version of the novel, and Spencer dropped everything to go on the road and promote the novel, even reciting the offensive “spoilt Cootchie” section with no major reservations (and apparently no idea of her good friend unwittingly (?) inserting a known slur used during segregation that all blacks carried venereal disease, thus it was used as an excuse to block integration and association with African Americans, especially when school integration was an issue). From my research and public statements by Tate Taylor, Stockett and Spencer, they were both there during the creation of the novel. Connecting the dots, I’d say Spencer, being a former comedian came up with dialogue and such for some of the black characters, Tate Taylor worked on a few things, and Stockett took full credit for the novel. The end result was a group of “Friends” got a strong foothold into Hollywood, as they’d planned. Wow! So much helpful info, and a great job on the character analasis! I wish I came across this blog earlier as I’m using the movie to tell my pupils about segregation as part of American history and the movie is harsh enough for teenagers. I see the point about whitewashing, but what can be a better tool to tell about segregation in modern society to teenagers who’ve never heard of it? We, in Russia read “Huckleberry Finn” at school, as part of the program, but that is it on racism. I’m teaching English privately to kids who want to know more, we talk a lot about UK and American history. I think it would be best to read a book by an author who isn’t white. Who would you recommend, taking into account that English is a second language for us?